supply the gems and precious metals for your creation and can also create a new design from your existing jewelry. 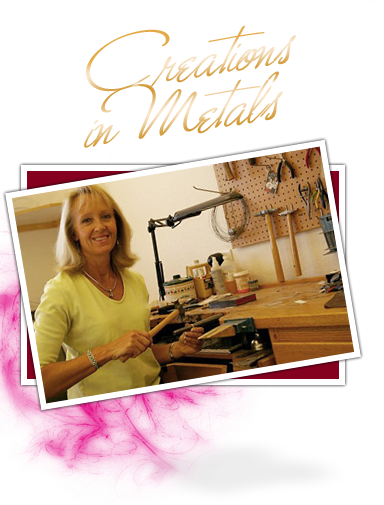 Debbie's studio is located in Windsor, Colorado. She works directly with her clients providing personalized service and guaranteed satisfaction. Each piece of jewelry is custom designed to the highest standards. Debbie was born and raised in Loveland, Colorado. She grew up on a farm which taught her a good work ethic and responsibility at an early age. Her interest in jewelry started in a high school jewelry class. She received her Bachelor of Fine Arts from Northern Arizona University where she studied art, jewelry design, and metalsmithing. She has also attended classes at Colorado State University for her Master of Fine Arts degree. Debbie and her husband have raised four wonderful children and currently reside in Windsor, where they built a home on one of the family farms. She has four horses and continues her hobby of barrel racing.